Ñaupa Iglesia is a fascinating Peruvian ruin in the Sacred Valley of the high Andes. It is located between Ollantaytambo and Urubamba; Ollantaytambo being only 30 Km (18.64 miles) from Machu Picchu. Although tradition credits Ñaupa Iglesia as Inca origin, this does not stand detailed scrutiny as the Inca did not have the technology. Inca construction does surround the site though. Ñaupa Iglesia predates the Inca - how long we do not know, but possibly thousands of years. Ñaupa Iglesia also has some very interesting geometry that shows a detailed understanding of astronomy and vibration. Even more fascinating is that the geometry links Ñaupa Iglesia with Egypt - certain angles and ratios can also be found in the great pyramids of Egypt. Another interesting element of Ñaupa Iglesia is the rock; Bluestone is in stark contrast with the surrounding sandstone. Bluestone contains a type of crystal that was used in early radio receivers for its excellent piezoelectric qualities and it’s magnetic. The Inca inherited Ñaupa Iglesia and they gave it the name Ñaupa Waka . The meaning of this is explained by my friend Pedro Luis below. Pedro also discusses the complete site, which has other constructions that are of Inca origin and how Ñaupa Waka fits Andean (Inca) cosmology. So, was this cosmology inherited from the Ñaupa Waka builders? There are many questions about this amazing ruin. Pedro provides some of the views of others and in certain cases his own interpretation. Ñaupa Waka has been deliberately destroyed. Photographs show bore holes and from them it can be clearly seen that large pieces of rock have been removed. Another question is who did this and why? Drilling into hard rock needs special tools and these were not available to the Spanish in the 16th Century. There are parallels elsewhere that suggest these holes were probably drilled during construction. There really doesn’t seem any alternative, considering the technology required and the depth of the holes. However they were drilled, it is obvious that some form of explosive, probably black powder, was later placed inside them and the site was ‘blown up’. Why this was done, probably by the Spanish, is open to conjecture, however, it is my hypothesis that it was due to the Spanish recognition of the powerful energy of the site. It didn’t fit within Christian dogma. Ñaupa Waka is a fascinating site and the Sacred Valley has a special energy of its own, sites like Ñaupa Waka focus this energy, words cannot describe it, it has to be experienced. Ñaupa means ‘Church’ (from the Quechua language: ñaupa: old, ancient). The Ñaupas are inhabitants of the spirit world, or of worlds before our own. Mythology has it that they can travel across space by manifesting themselves around sunset or dawn at certain sacred locations. According to Andean tradition, a meeting with the Ñaupas can be extremely dangerous, their secret dwellings as well as the portals through which they cross into this world, are better left undisturbed. Waka is a Quechuan word for place or house. To the local people Ñaupa Iglesia is known as Ñaupa Waka. Dominating Ñaupa Waka is the cave ceiling forming an inverted ‘V’. It has been cut and smoothed with laser-like precision to create two different yet specific angles: 60 and 52 degrees. There is only one other major place on earth where these two numbers appear side by side, the angle slopes of the two major pyramids at Giza. In the late intermediate Inca period, a set of terraces were created to grow maize (corn), potatoes, and other plants offered to ancestors and Divinities. The bedrock is sliced with great precision to create a shallow door that goes nowhere. The same design appears in ancient Persia and Egypt. Then for good measure, they carved an additional altar with three alcoves into an outcrop of bluestone. 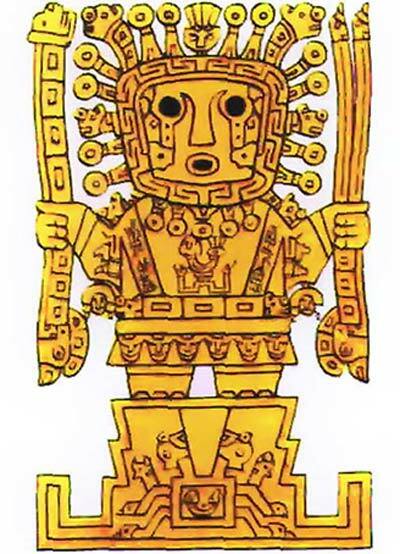 The traditional assumption that the architects were Inca can be dismissed. Inca stonework pales by comparison in both scale and quality. The Inca merely inherited and maintained a culture that was, by their time of the 16th century, already long vanished. The ancient Aymara claimed such temples were long before the Inca. The style of stonework at Ñaupa Waka is consistent with that found in Cuzco, Ollantaytambo, and Puma Punku, and what these sites have in common is the myth of a traveling builder God named ‘Viracocha’ who, together with seven ‘Shining Ones’, appeared at Tiwanaku after a catastrophic world flood, since dated to 9703 BC, to help rebuild humanity. Ñaupa Waka is the same style as Ñaupa Rumi from the Hanan Pacha, the biblical time of paradise on earth. In Inca mythology, this time would have been the time of “land of the heaven above”. Edwin Salazar Garcés, scientific director of Planetarium Cusco, says that the axes of the Ñaupa Waka stone altar, projected at certain times of the year, point to positions of stars and constellations known by the Inkas (Incas). The open chambers have different dimensions and depths, and their axes point to three different directions facing the horizon. Such stellar alignments were very accurate in the early 16th century, when the Inka state reached its greatest splendor and grandeur. Nowadays they have moved a little and do not agree with our calendrical dates due to the precession movement of the equinoxes, it is still, however, verifiable by very close approximation. The axis of the carving denoted as No.1 (see photo below), has an azimuth of 149 ° and pointed (in 1500 AD) at the exit of the Cruz del Sur (above the hill) on April 26 at 18:15 hours. This was the evening of the day of the Sun Nadir and announced the beginning of the big harvest that happens in the month of May. The central chamber (denoted as number 2), has an azimuth of 137 and points (1500 AD) to the group of stars that form the tail of the western constellation of the Scorpion, for the Inkas, the Amaru. The axis pointed exactly at the star Sargas (Theta star of the Scorpion). This happened on June 21 at 18:30 hours. The day of the beginning of ‘Inti Raymi’. The same axis receives, at noon on October 30 (the day of the Sun Cenit), the light of the Sun that falls in a zenith, just at the moment of the passage of the Sun by the meridian at this place, at 11:30 am. A spike that protrudes above the rock roof (which appears to have been the carved head of a bird) points precisely above this central chamber and would have coincided with some ritual ceremony. We remember that in Inca times this date belonged to the month of the "Aya Marq'ay", (month of the procession of the dead) and closes with the modern day of the deceased, November 2nd. Notation number 3 points with an azimuth of 102 -103 degrees at the exit of the star Sirio (Alpha of the Major Can) or Willkawara for the Inkas (1500 AD). This occurred around August 18, at 04:00 hours, the day of ritual planting. The same alignment was visible on December 23 at 19:15 hours, the day of Qhapaq Raymi. Thus, its energy is certainly stellar and not earthly. Is Ñaupa Waka a Dimensional Gateway? The rock-cut doorway truly looks like a gateway into another world. One would actually need magical powers to cross through solid rock. It’s not by accident such 'doors' are referred to as spirit doors or windows into paradise. Were the perfectly drilled holes part of the original construction? This is not unlikely, given the fact that similar holes are also found in hard stone at other sites in Peru and Bolivia, most notably at Tiwanaku, Cusco, and Ollantaytambo. It takes a hard heart to stand there and not feel the palpable energy of Ñaupa Waka. It is both transfixing and bewitching. The measurements of the main portal of Ñaupa Waka are not random. The length to height ratio is 3:1, making a perfect musical fifth in the second octave; the ratio of the alcove is 5:6, a minor third. The 5:6 ratio is both unusual and filled with special information. It perfectly describes the movement of the Earth, whose pole completes one full rotation of its axis every 25,920 years, while the plane of the equator tilts four degrees every 21,000 years, a ratio of 5:6. This accurate calculation of the motion of the planet is also encoded in another unusual temple, the Bent Pyramid of Egypt, whose slope angles encode the same ratio. Ñaupa Waka’s creator(s) picked the exact spot on the side of the mountain where a single outcrop of bluestone exists in stark contrast with the surrounding sandstone. Bluestone is also found in the oldest part of Stonehenge, leading its architects to source this sonorous granite 150 miles (241.4 Km) away in Wales. The outcrop has been expertly carved into three niches, and, although partly destroyed, the delicate workmanship is still evident. Its central niche is similarly cut to the ratio 3:2, again a perfect fifth. The three-step design defines the Andean view of the Universe. The underworld, the physical middle-world, and the ethereal other-world. The concept is idealized in the chakana, commonly known as the Andean Cross. Chakana literally means 'to bridge or cross', and it describes how the three levels of existence are connected to each other. This is a culturally shared concept in ancient Persia, Egypt, the southwestern US, and the Celtic world. The oldest iteration of the design is carved on a monolith at Tiwanaku, the world's oldest temple complex, based not on a square but a rectangle with a ratio of 5:6. When you first see the stone-throne at the mouth of the ancient site, you immediately want to sit in it. When you do you feel your back connecting deeply into the rock. When you sit in the ‘side-chair’, you sense you have a more objective viewpoint, off to the side, not within the center of the swirling vortex of energy. The contemporary Andean mystic is concerned with preparing "The Return of the Inka" through participation in pilgrimages to traditional sanctuaries, realization of initiatory pilgrimages, realization of propitiatory acts, training and initiations of practitioners, as well as initiatory exchanges with other traditions. Being the supreme value of our tradition, the Ayni (or generous reciprocal exchange), pilgrimages to sanctuaries, initiation rituals, acts of propitiation, training and initiations of practitioners, and initiatory exchanges with other traditions are all aimed at establishing a great Cosmic reciprocity, called Teq'se Ayni. Tradition considers a program to prepare "The Return of Inka" or, equivalent to the same, to cooperate with the social transition to a new era of human fullness - called "Taripay Pacha" or "God Holy Spirit Pacha". David Walton was a Director of an AIM and Nasdaq company, he has had an illustrious commercial career however after winning a £1.5 billion contract on behalf of British Telecom, he realised it meant nothing. In 2016 David published his first book, “There is More to Life” which describes his amazing journey from being a successful businessman in England to running Munay Medicine a plant medicine retreat in the Sacred Valley, Peru. David says helping people discover themselves is more rewarding than anything he ever achieved commercially. Pedro-Luis Lozada has been teaching and facilitating workshops on Andean cross-cultural mysticism since 2011. He has also been leading spiritual and alternative history and archaeology expeditions to Peru and Bolivia since 2006. Pedro-Luis holds an undergraduate degree in Cultural Anthropology from The University of Wisconsin at Madison (USA) and a Master’s degree in Textile and Clothing Technology Engineering from The Niederrhein Polytechnic University of Applied Sciences (Germany), and has been trained as an outdoor survival guide through the National Outdoor Leadership School (NOLS). Naupa Iglesia: An Egyptian Portal in the Andes? Read more about Naupa Iglesia: An Egyptian Portal in the Andes?